I gave this 4 stars since it has plastic instead of glass. But, the pictures are good for the spot selected since we walk past them all the time. 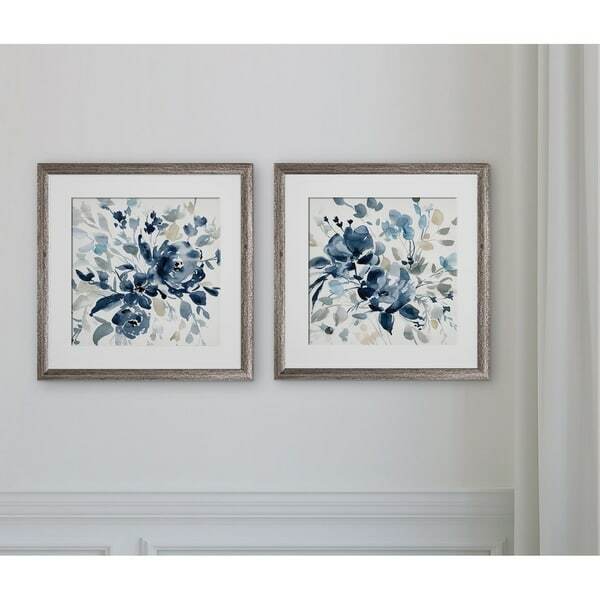 Indigo Garden I -2 Piece Set 2 Custom Framed Prints. 100% and created to last. Individually printed and framed by hand to very high standards. Printed and inspected one at a time utilizing the latest archival UltraChrome Giclee inks Consisting of 2 Total Framed Pieces Each measuring 16''x16'' x .75'' deep Each Piece is Individually Framed Acrylic Glass Each piece includes hanging accessories and is ready to hang. You need only to apply an anchor to the wall of your choice. I love this product! I wanted something that blended all of the colors of my newly remodeled bath room and these two pictures did the job. The frame is solid and the quality of the product is very good and I don't have to worry about if they break because they have already sustained a toddler test (my 3 year old jumped on the box after they were delivered). Love these. Only wish there were a set of 4! I really liked these pictures but did not realize the 'glass' was actually plastic/very thin plexiglass. But they do look nice. This is a great art! The color matches to the website. I would recommend to my friends!